We offer age related sessions for pre-school children and toddlers in a safe, secure and caring environment. 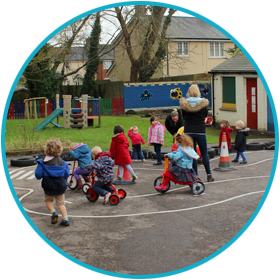 The nursery is ideally located next to Usk Primary School in a purpose built educational facility and is run by fully qualified early years staff. We aim to provide the children in our care with an environment where they will be treated with kindness, patience and courtesy. Each child’s individuality is respected and cherished and in turn, the children will learn that acquiring skills and knowledge is fun. All activities will be taught through play, providing your child with fun experiences to allow them to achieve their potential. 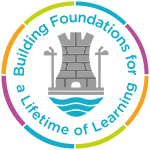 Usk Nursery works in Partnership with the LEA to provide term-time Foundation Phase Education. We undertake self-evaluation and provide an annual Quality Assurance Report. We follow the same term dates as Usk School but not all our Inset Days will be the same. For the latest updates and news from the nursery, please add us on Facebook. 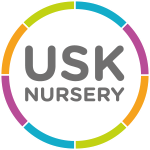 Search for "Usk Nursery" and send us a friend request. We keep our account personal for the privacy of the children.